The distribution of ionized hydrogen (known by astronomers as H II from old spectroscopic terminology) in the parts of the Galactic interstellar medium visible from the Earth's northern hemisphere as observed with the Wisconsin Hα Mapper (Haffner et al. 2003). 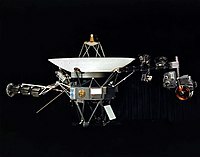 Voyager 1 is the first artificial object to reach the ISM. Table 1 shows a breakdown of the properties of the components of the ISM of the Milky Way. Field, Goldsmith & Habing (1969) put forward the static two phase equilibrium model to explain the observed properties of the ISM. Their modeled ISM consisted of a cold dense phase (T < 300 K), consisting of clouds of neutral and molecular hydrogen, and a warm intercloud phase (T ~ 104 K), consisting of rarefied neutral and ionized gas. McKee & Ostriker (1977) added a dynamic third phase that represented the very hot (T ~ 106 K) gas which had been shock heated by supernovae and constituted most of the volume of the ISM. These phases are the temperatures where heating and cooling can reach a stable equilibrium. Their paper formed the basis for further study over the past three decades. However, the relative proportions of the phases and their subdivisions are still not well known. This model takes into account only atomic hydrogen : Temperature larger than 3000 K breaks molecules, lower than 50 000 K leaves atoms in their ground state. It is assumed that influence of other atoms (He ...) is negligible. Pressure is assumed very low, so that durations of free paths of atoms are larger than the ~ 1 nanosecond duration of light pulses which make ordinary, temporally incoherent light. In this collisionless gas, Einstein’s theory of coherent light-matter interactions applies, all gas-light interactions are spatially coherent. Suppose that a monochromatic light is pulsed, then scattered by molecules having a quadrupole (Raman) resonance frequency. If “length of light pulses is shorter than all involved time constants” (Lamb (1971)), an “impulsive stimulated Raman scattering (ISRS) ” (Yan, Gamble & Nelson (1985)) works: While light generated by incoherent Raman at a shifted frequency has a phase independent on phase of exciting light, thus generates a new spectral line, coherence between incident and scattered light allows their interference into a single frequency, thus shifts incident frequency. Assume that a star radiates a continuous light spectrum up to X rays. Lyman frequencies are absorbed in this light and pump atoms mainly to first excited state. In this state, hyperfine periods are longer than 1 ns, so that an ISRS “may” redshift light frequency, populating high hyperfine levels. An other ISRS “may” transfer energy from hyperfine levels to thermal electromagnetic waves, so that redshift is permanent. Temperature of a light beam is defined from frequency and spectral radiance by Planck’s formula. As entropy must increase, “may” becomes “does”. However, where a previously absorbed line (first Lyman beta, ...) reaches Lyman alpha frequency, redshifting process stops and all hydrogen lines are strongly absorbed. But the stop is not perfect if there is energy at frequency shifted to Lyman beta frequency, which produces a slow redshift. Successive redshifts separated by Lyman absorptions generate many absorption lines, frequencies of which, deduced from absorption process, obey a law more dependable than Karlsson’s formula. The previous process excites more and more atoms because a de-excitation obeys Einstein’s law of coherent interactions: Variation dI of radiance I of a light beam along a path dx is dI=BIdx, where B is Einstein amplification coefficient which depends on medium. I is the modulus of Poynting vector of field, absorption occurs for an opposed vector, which corresponds to a change of sign of B. Factor I in this formula shows that intense rays are more amplified than weak ones (competition of modes). Emission of a flare requires a sufficient radiance I provided by random zero point field. After emission of a flare, weak B increases by pumping while I remains close to zero: De-excitation by a coherent emission involves stochastic parameters of zero point field, as observed close to quasars (and in polar auroras). Three-dimensional structure in Pillars of Creation. The ISM is turbulent and therefore full of structure on all spatial scales. Stars are born deep inside large complexes of molecular clouds, typically a few parsecs in size. During their lives and deaths, stars interact physically with the ISM. Stellar winds from young clusters of stars (often with giant or supergiant HII regions surrounding them) and shock waves created by supernovae inject enormous amounts of energy into their surroundings, which leads to hypersonic turbulence. The resultant structures – of varying sizes – can be observed, such as stellar wind bubbles and superbubbles of hot gas, seen by X-ray satellite telescopes or turbulent flows observed in radio telescope maps. The Sun is currently traveling through the Local Interstellar Cloud, a denser region in the low-density Local Bubble. Short, narrated video about IBEX's interstellar matter observations. The interstellar medium begins where the interplanetary medium of the Solar System ends. The solar wind slows to subsonic velocities at the termination shock, 90–100 astronomical units from the Sun. In the region beyond the termination shock, called the heliosheath, interstellar matter interacts with the solar wind. Voyager 1, the farthest human-made object from the Earth (after 1998), crossed the termination shock December 16, 2004 and later entered interstellar space when it crossed the heliopause on August 25, 2012, providing the first direct probe of conditions in the ISM (Stone et al. 2005). The ISM is also responsible for extinction and reddening, the decreasing light intensity and shift in the dominant observable wavelengths of light from a star. These effects are caused by scattering and absorption of photons and allow the ISM to be observed with the naked eye in a dark sky. The apparent rifts that can be seen in the band of the Milky Way – a uniform disk of stars – are caused by absorption of background starlight by molecular clouds within a few thousand light years from Earth. Far ultraviolet light is absorbed effectively by the neutral components of the ISM. For example, a typical absorption wavelength of atomic hydrogen lies at about 121.5 nanometers, the Lyman-alpha transition. Therefore, it is nearly impossible to see light emitted at that wavelength from a star farther than a few hundred light years from Earth, because most of it is absorbed during the trip to Earth by intervening neutral hydrogen. The ISM is usually far from thermodynamic equilibrium. Collisions establish a Maxwell–Boltzmann distribution of velocities, and the 'temperature' normally used to describe interstellar gas is the 'kinetic temperature', which describes the temperature at which the particles would have the observed Maxwell–Boltzmann velocity distribution in thermodynamic equilibrium. However, the interstellar radiation field is typically much weaker than a medium in thermodynamic equilibrium; it is most often roughly that of an A star (surface temperature of ~10,000 K) highly diluted. Therefore, bound levels within an atom or molecule in the ISM are rarely populated according to the Boltzmann formula (Spitzer 1978, § 2.4). Depending on the temperature, density, and ionization state of a portion of the ISM, different heating and cooling mechanisms determine the temperature of the gas. The first mechanism proposed for heating the ISM was heating by low-energy cosmic rays. Cosmic rays are an efficient heating source able to penetrate in the depths of molecular clouds. Cosmic rays transfer energy to gas through both ionization and excitation and to free electrons through Coulomb interactions. Low-energy cosmic rays (a few MeV) are more important because they are far more numerous than high-energy cosmic rays. The ultraviolet radiation emitted by hot stars can remove electrons from dust grains. The photon is absorbed by the dust grain, and some of its energy is used to overcome the potential energy barrier and remove the electron from the grain. This potential barrier is due to the binding energy of the electron (the work function) and the charge of the grain. The remainder of the photon's energy gives the ejected electron kinetic energy which heats the gas through collisions with other particles. A typical size distribution of dust grains is n(r) ∝ r−3.5, where r is the radius of the dust particle. Assuming this, the projected grain surface area distribution is πr2n(r) ∝ r−1.5. This indicates that the smallest dust grains dominate this method of heating. When an electron is freed from an atom (typically from absorption of a UV photon) it carries kinetic energy away of the order Ephoton − Eionization. This heating mechanism dominates in H II regions, but is negligible in the diffuse ISM due to the relative lack of neutral carbon atoms. X-rays remove electrons from atoms and ions, and those photoelectrons can provoke secondary ionizations. As the intensity is often low, this heating is only efficient in warm, less dense atomic medium (as the column density is small). For example, in molecular clouds only hard x-rays can penetrate and x-ray heating can be ignored. This is assuming the region is not near an x-ray source such as a supernova remnant. Molecular hydrogen (H2) can be formed on the surface of dust grains when two H atoms (which can travel over the grain) meet. This process yields 4.48 eV of energy distributed over the rotational and vibrational modes, kinetic energy of the H2 molecule, as well as heating the dust grain. This kinetic energy, as well as the energy transferred from de-excitation of the hydrogen molecule through collisions, heats the gas. Collisions at high densities between gas atoms and molecules with dust grains can transfer thermal energy. This is not important in HII regions because UV radiation is more important. It is also not important in diffuse ionized medium due to the low density. In the neutral diffuse medium grains are always colder, but do not effectively cool the gas due to the low densities. Grain heating by thermal exchange is very important in supernova remnants where densities and temperatures are very high. where T is the gas temperature, Td the dust temperature, and T2 the post-collision temperature of the gas atom or molecule. This coefficient was measured by (Burke & Hollenbach 1983) as α = 0.35. The process of fine structure cooling is dominant in most regions of the Interstellar Medium, except regions of hot gas and regions deep in molecular clouds. It occurs most efficiently with abundant atoms having fine structure levels close to the fundamental level such as: C II and O I in the neutral medium and O II, O III, N II, N III, Ne II and Ne III in H II regions. Collisions will excite these atoms to higher levels, and they will eventually de-excite through photon emission, which will carry the energy out of the region. At lower temperatures, more levels than fine structure levels can be populated via collisions. For example, collisional excitation of the n = 2 level of hydrogen will release a Ly-α photon upon de-excitation. In molecular clouds, excitation of rotational lines of CO is important. Once a molecule is excited, it eventually returns to a lower energy state, emitting a photon which can leave the region, cooling the cloud. Atmospheric attenuation in dB/km as a function of frequency over the EHF band. Peaks in absorption at specific frequencies are a problem, due to atmosphere constituents such as water vapor (H2O) and carbon dioxide (CO2). Radio waves from ≈10 kHz (very low frequency) to ≈300 GHz (extremely high frequency) propagate differently in interstellar space than on the Earth's surface. There are many sources of interference and signal distortion that do not exist on Earth. A great deal of radio astronomy depends on compensating for the different propagation effects to uncover the desired signal. Herbig–Haro 110 object ejects gas through interstellar space. The nature of the interstellar medium has received the attention of astronomers and scientists over the centuries, and understanding of the ISM has developed. However, they first had to acknowledge the basic concept of "interstellar" space. The term appears to have been first used in print by Bacon (1626, § 354���5): "The Interstellar Skie.. hath .. so much Affinity with the Starre, that there is a Rotation of that, as well as of the Starre." Later, natural philosopher Robert Boyle (1674) discussed "The inter-stellar part of heaven, which several of the modern Epicureans would have to be empty." Before modern electromagnetic theory, early physicists postulated that an invisible luminiferous aether existed as a medium to carry lightwaves. It was assumed that this aether extended into interstellar space, as Patterson (1862) wrote, "this efflux occasions a thrill, or vibratory motion, in the ether which fills the interstellar spaces." The advent of deep photographic imaging allowed Edward Barnard to produce the first images of dark nebulae silhouetted against the background star field of the galaxy, while the first actual detection of cold diffuse matter in interstellar space was made by Johannes Hartmann in 1904 through the use of absorption line spectroscopy. In his historic study of the spectrum and orbit of Delta Orionis, Hartmann observed the light coming from this star and realized that some of this light was being absorbed before it reached the Earth. Hartmann reported that absorption from the "K" line of calcium appeared "extraordinarily weak, but almost perfectly sharp" and also reported the "quite surprising result that the calcium line at 393.4 nanometres does not share in the periodic displacements of the lines caused by the orbital motion of the spectroscopic binary star". The stationary nature of the line led Hartmann to conclude that the gas responsible for the absorption was not present in the atmosphere of Delta Orionis, but was instead located within an isolated cloud of matter residing somewhere along the line-of-sight to this star. This discovery launched the study of the Interstellar Medium. In the series of investigations, Viktor Ambartsumian introduced the now commonly accepted notion that interstellar matter occurs in the form of clouds. Following Hartmann's identification of interstellar calcium absorption, interstellar sodium was detected by Heger (1919) through the observation of stationary absorption from the atom's "D" lines at 589.0 and 589.6 nanometres towards Delta Orionis and Beta Scorpii. Subsequent observations of the "H" and "K" lines of calcium by Beals (1936) revealed double and asymmetric profiles in the spectra of Epsilon and Zeta Orionis. These were the first steps in the study of the very complex interstellar sightline towards Orion. Asymmetric absorption line profiles are the result of the superposition of multiple absorption lines, each corresponding to the same atomic transition (for example the "K" line of calcium), but occurring in interstellar clouds with different radial velocities. Because each cloud has a different velocity (either towards or away from the observer/Earth) the absorption lines occurring within each cloud are either Blue-shifted or Red-shifted (respectively) from the lines' rest wavelength, through the Doppler Effect. These observations confirming that matter is not distributed homogeneously were the first evidence of multiple discrete clouds within the ISM. 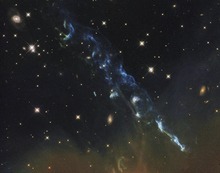 This light-year-long knot of interstellar gas and dust resembles a caterpillar. The growing evidence for interstellar material led Pickering (1912) to comment that "While the interstellar absorbing medium may be simply the ether, yet the character of its selective absorption, as indicated by Kapteyn, is characteristic of a gas, and free gaseous molecules are certainly there, since they are probably constantly being expelled by the Sun and stars." The same year Victor Hess's discovery of cosmic rays, highly energetic charged particles that rain onto the Earth from space, led others to speculate whether they also pervaded interstellar space. The following year the Norwegian explorer and physicist Kristian Birkeland wrote: "It seems to be a natural consequence of our points of view to assume that the whole of space is filled with electrons and flying electric ions of all kinds. We have assumed that each stellar system in evolutions throws off electric corpuscles into space. It does not seem unreasonable therefore to think that the greater part of the material masses in the universe is found, not in the solar systems or nebulae, but in 'empty' space" (Birkeland 1913). Thorndike (1930) noted that "it could scarcely have been believed that the enormous gaps between the stars are completely void. Terrestrial aurorae are not improbably excited by charged particles emitted by the Sun. If the millions of other stars are also ejecting ions, as is undoubtedly true, no absolute vacuum can exist within the galaxy." In February 2014, NASA announced a greatly upgraded database for tracking polycyclic aromatic hydrocarbons (PAHs) in the universe. According to scientists, more than 20% of the carbon in the universe may be associated with PAHs, possible starting materials for the formation of life. PAHs seem to have been formed shortly after the Big Bang, are widespread throughout the universe, and are associated with new stars and exoplanets. ^ Herbst, Eric (1995). "Chemistry in The Interstellar Medium". Annual Review of Physical Chemistry. 46: 27–54. Bibcode:1995ARPC...46...27H. doi:10.1146/annurev.pc.46.100195.000331. ^ Boulanger, F.; Cox, P.; Jones, A. P. (2000). "Course 7: Dust in the Interstellar Medium". In F. Casoli; J. Lequeux; F. David (eds.). Infrared Space Astronomy, Today and Tomorrow. p. 251. Bibcode:2000isat.conf..251B. ^ "The Pillars of Creation Revealed in 3D". European Southern Observatory. 30 April 2015. Retrieved 14 June 2015. ^ "Voyager: Fast Facts". Jet Propulsion Laboratory. ^ Mathis, J.S. ; Rumpl, W.; Nordsieck, K.H. (1977). "The size distribution of interstellar grains". Astrophysical Journal. 217: 425. Bibcode:1977ApJ...217..425M. doi:10.1086/155591. ^ Weingartner, J.C.; Draine, B.T. (2001). "Photoelectric Emission from Interstellar Dust: Grain Charging and Gas Heating". Astrophysical Journal Supplement Series. 134 (2): 263–281. arXiv:astro-ph/9907251. Bibcode:2001ApJS..134..263W. doi:10.1086/320852. ^ Samantha Blair. "Interstellar Medium Interference (video)". SETI Talks. ^ "Voyager 1 Experiences Three Tsunami Waves in Interstellar Space (video)". JPL. ^ "A geyser of hot gas flowing from a star". ESA/Hubble Press Release. Retrieved 3 July 2012. ^ "Hubble sees a cosmic caterpillar". Image Archive. ESA/Hubble. Retrieved 9 September 2013. Haffner, L. M.; Reynolds, R. J.; Tufte, S. L.; Madsen, G. J.; Jaehnig, K. P.; Percival, J. W. (2003), "The Wisconsin Hα Mapper Northern Sky Survey", Astrophysical Journal Supplement, 145 (2): 405, arXiv:astro-ph/0309117, Bibcode:2003ApJS..149..405H, doi:10.1086/378850 . The Wisconsin Hα Mapper is funded by the National Science Foundation. Lamb G. L. Jr. “Analytical description of ultra-short optical pulse propagation in a resonant medium”, Rev. Mod. Phys., 43, 99-124. Lequeux, J. The Interstellar Medium. Springer 2005. Patterson, Robert Hogarth (1862), "Colour in nature and art", Essays in History and Art, 10 Reprinted from Blackwood's Magazine. Yan, Y. X.; Gamble, E.B. Jr.; Nelson K. A. (1985), “Impulsive Stimulated Scattering: General Importance in Femto-second Laser Pulse Interactions with Matter and Spectroscopic Applications”, J. Chem. Phys., 83, 3591–5399. Freeview Video 'Chemistry of Interstellar Space' William Klemperer, Harvard University. A Royal Institution Discourse by the Vega Science Trust.